available for 2019 and 2020 start. More details. 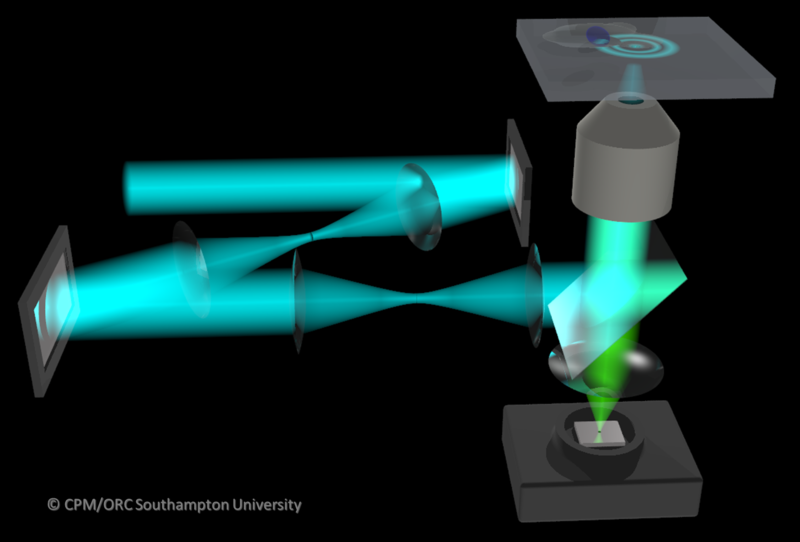 The Nanoscope project continues at Southampton in a collaboration between the Institute for Life Sciences and the Optoelectronics Research Centre. We are working on the developing super-oscillatory imaging for biological and biomedical applications. The original Nanoscope project demonstrated a super-resolution optical imaging technology with published results demonstrating resolution 3 times better than conventional microscopes on fabricated test structures. It uses specially designed lenses that carefully engineer light to form very small spots, in the presence of sidebands – trading resolution for efficiency. The aim of this project is to exploit this technology for use in biomedical imaging. The capacity to image live and fixed cell preparations is a core procedure in biomedical investigation in education, research and diagnostics. Despite significant advances in imaging protocols, instrumentation, image extraction and reconstruction, the physical limits remain a significant constraint. Sample preparation prior to imaging can be considerable in terms of time, reagents and manipulation, and there is debate as to the degree of artifact introduced into samples during preparation. The Nanoscope gives access for the first time to label-free non-invasive imaging of objects with a resolution beating the diffraction limit of conventional microscopes several times over. The instrument has been developed, tested and validated in materials science. We are now re-engineering the sample platform to accommodate the imaging of biological specimens. We intend to maximize the utility of the instrument by developing the capacity for real-time, live cell imaging.